It’s getting steamy hot here in North Carolina. It reminds me of growing up in Southern California pre-air conditioning, when my mom would shut windows and shades tight as soon as the sun came up trying to keep the chill desert night contained for another day. We learned to hunker down in summer heat. Now, I like going to a matinee movie to keep cool and can walk to one easily from my downtown condo. CHECK OUT THE SALE. PRICES REDUCED BELOW. I’m leaving here on June 22 to begin my return to Oaxaca for the summer, where afternoon rains serve as nature’s air conditioning. This means, if you are interested in shopping and ordering, you need to do this before June 20. Okay, now for the goodies. 1A. 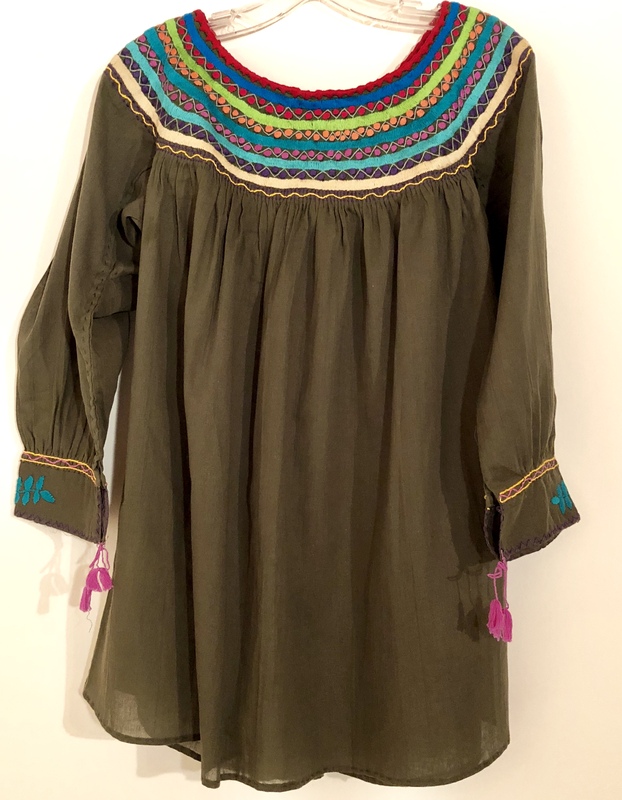 This San Antonino dress has been part of my collection, new and never worn. 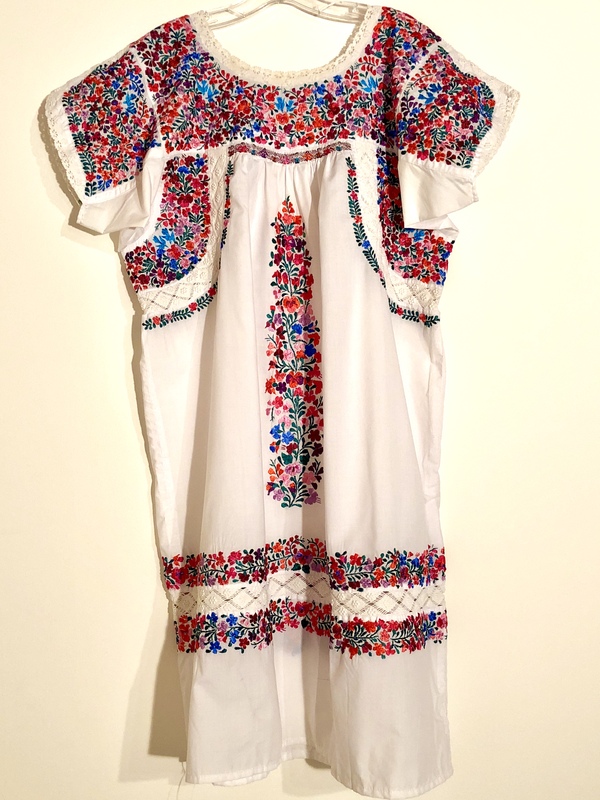 Notice the dense embroidered flowers and birds, the tiny dolls on the bodice that serve to hold the gathers, the fine crochet work around the neckline, sleeve edges and skirt. Bodice is 24″ wide across the front, armpit to armpit. Dress measures 40″ long. Hard to find one like this now. WAS $275 USD. BUY IT NOW $225 USD. 1C. An abundance of flowers! 2. Sna Jolobil is the premiere cooperative in San Cristobal de Las Casas, Chiapas, founded by Chip Morris and Pedro Meza. 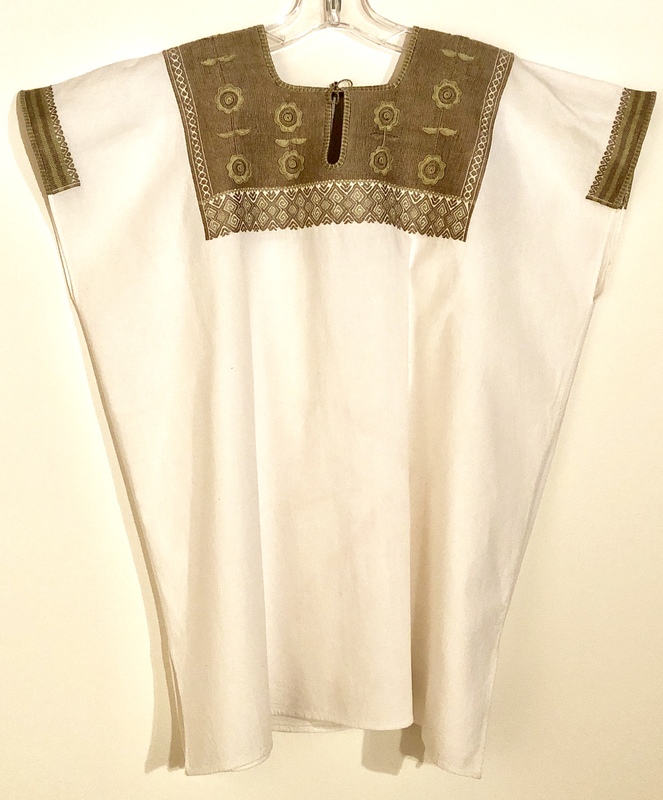 This pull-over is the finest 100% cotton and the embroidery hand-work is exquisite. It is a soft yellow green and the threads are so fine and dense you can’t see any of the base cloth. Measures 26″ wide by 28″ long. $125 USD. You can see their work at the Santa Fe International Folk Art Market this summer, too. SALE. BUY IT NOW FOR $89. 3. SOLD. This lightweight, comfortable all cotton blouse with long sleeves is totally made by hand. Even the finished French seams and hem are stitched by hand. All hand-embroidered bodice and sleeve accents. Perfect for casual wear or a dressy hot summer evening. 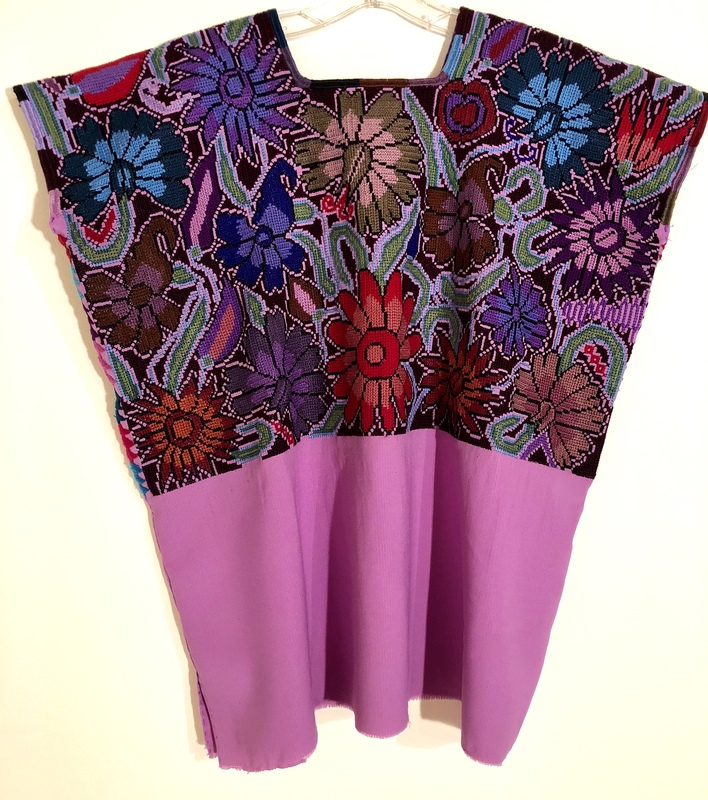 Measures 22″ wide across bodice from armpit to armpit and 30″ long. Size M-L. $85 USD. We go to Francisca’s house in this village on our 2019 Chiapas Textile Study Tour There are a few places left. Come with us. 4. SOLD. 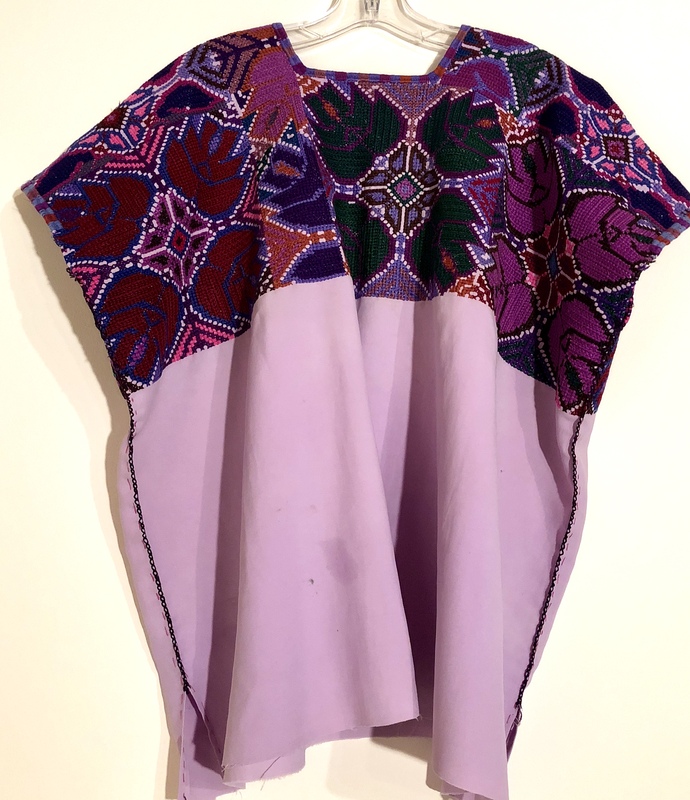 Another beauty from Francesca, this lightweight cotton blouse is trimmed in multi-colored cotton embroidery floss at neckline and cuff reflecting how Mexican women are not afraid of color. Measures 22″ wide at bust and 30″ long. Size M-L. $75 USD. 5. SOLD. 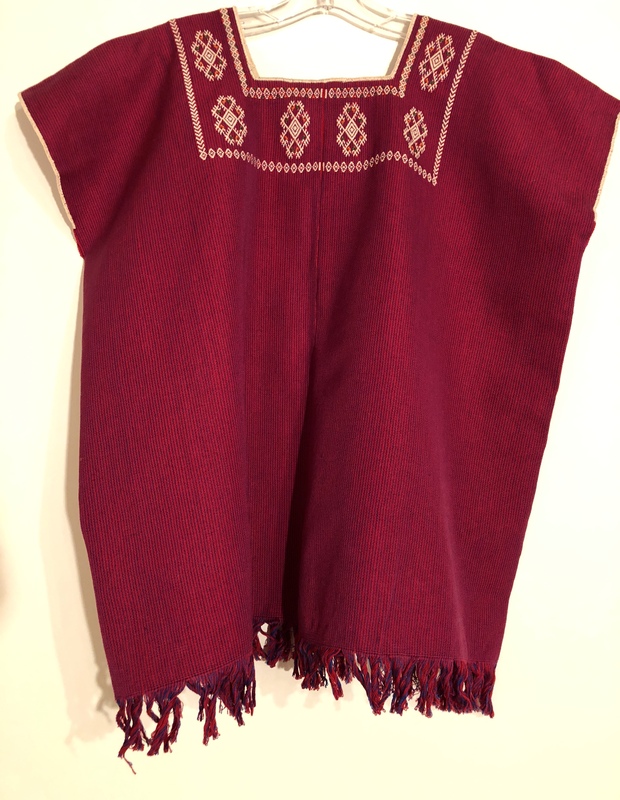 This cotton blouse is woven on a back-strap loom in the village of Aldama Magdalenas. I bought it from a small family cooperative there. It is excellent quality and the design is woven right into the cloth — a process called supplementary weft. Measures 24-1/2″ wide and 28″ long. WAS $75 USD.BUY IT NOW FOR $59 USD. 6. 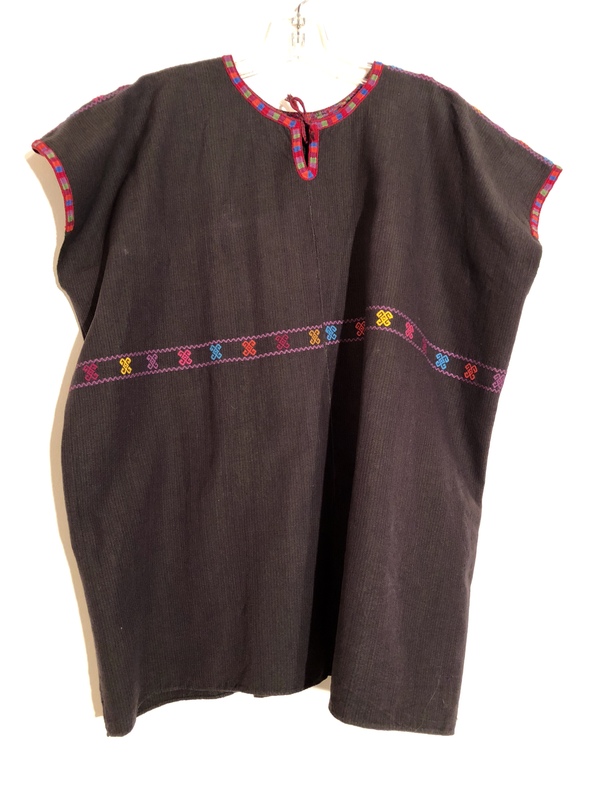 From the same cooperative in Aldama Magdalenas, this easy-to-care-for cotton blouse is woven on the back-strap loom in two pieces and stitched together by hand. The pattern across the chest is woven into the cloth. 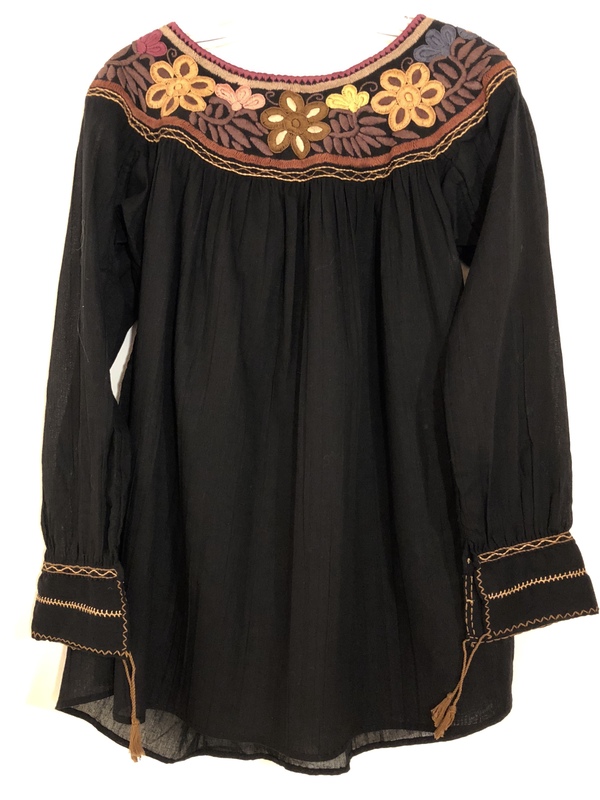 The trim around the neck and sleeve is embroidered by hand. SALE. WAS $65. USD. BUY IT NOW FOR $49 USD. 7. SOLD. Too beautiful to pass up! It is getting more difficult to find any hand-work in Zinacantan, Chiapas these days. This is done with punto de cruz or cross-stitch. The entire bodice is filled with flowers. The base cloth is polyester (full disclosure). The ladies there don’t care, since it washes up and will dry immediately without shrinkage. They wear the blouse tucked into their fanciful skirts, so the solid fabric doesn’t show. Measures 26″ wide x 28″ long. $125 USD. What can you use this for? Wear it! Hang it! Make a pillow out of it! 8. SOLD. 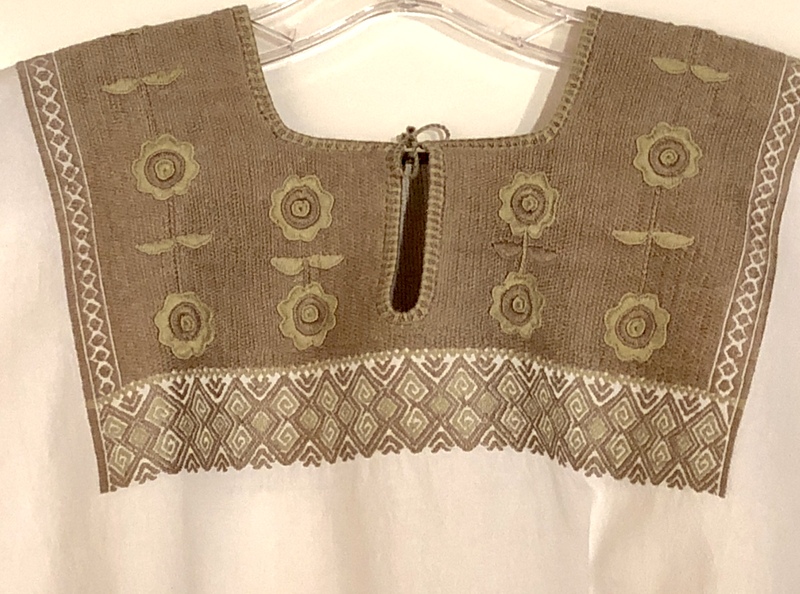 Here is another cross-stitch blouse with fine needlework. The seams are closed with hand-stitching, too. Base cloth is polyester and there are some stains on the cloth. So, I will sell this for much less than the other. Measures 30″ wide x 27″ long. $65 USD. What can you make from this one? A handbag? A pillow cover? Repurpose the embroidered part and sew it into the bodice of a new dress? 9. 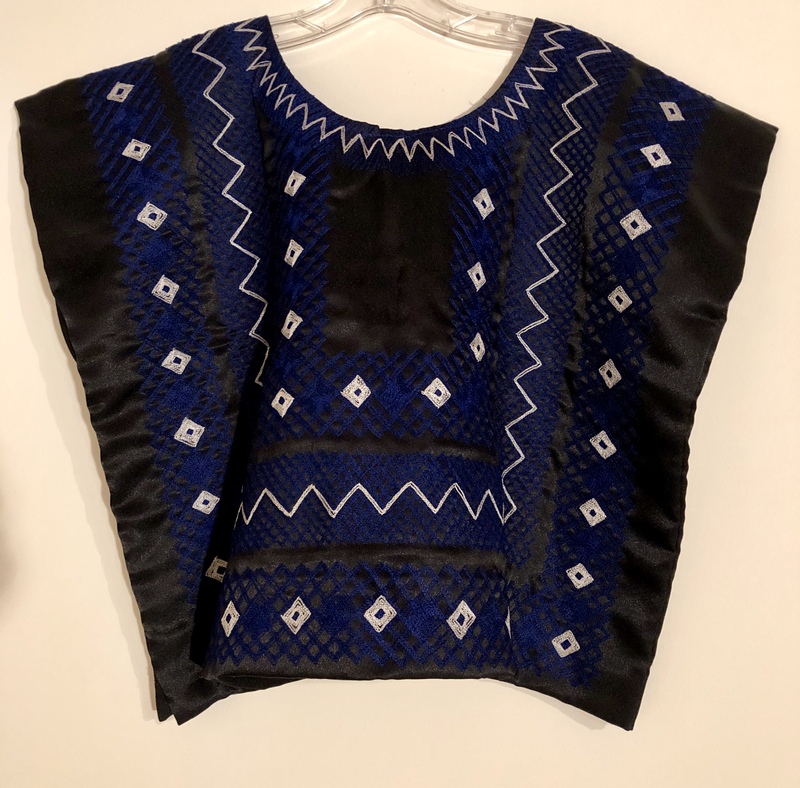 Slinky black fabric (I think it’s polyester or rayon) is lined with cotton, and then top-stitched by machine in contrasting navy blue and white. 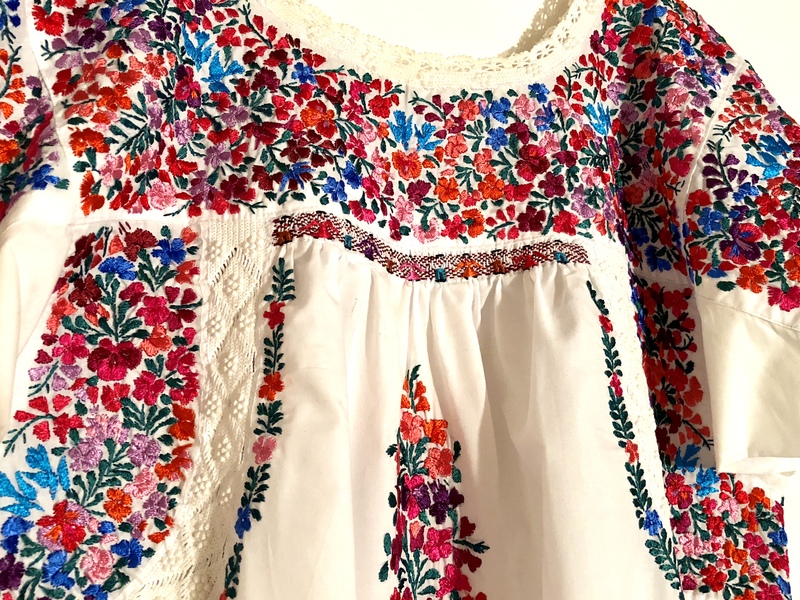 A stunning blouse to wear with pants or a flouncy Frida Kahlo-style skirt. Perfect for cocktails (think mango mezcal margarita) on the deck or terrace. SALE. WAS $75 USD. BUY IT NOW $59 USD. 10. SOLD. Zinacantan is the flower capital of Chiapas, exporting as far away as the Yucatan and Mexico City. Their love of flowers translates to all things clothing, ceremonial and daily wear, for men and women and children. The Chal is the necessary accessory and reflects a woman’s status (the more flowers, the more expensive) and aesthetics. Color and design popularity change each year. Sometimes we can find an outstanding barely worn chal like this one in the Sunday market. Fabric is cotton/poly blend with machine stitched embroidery. Measures 21-3/4″ wide x 46″ long. $125 USD. Wear it. Drape it over the back of a chair. Use it as a bed throw. Make it into a pillow. Hang it. Add sparkle and a lasting bouquet to your living area. I am constantly acquiring the hand-work of Mexican artisans. Mostly because I love and appreciate their talent, because I enjoy showing that appreciation when I visit their homes and workshops by buying something despite the fact that I don’t need it! I rarely bargain, paying what they ask. I know that hours of work goes into making a garment or a piece of jewelry. Sometimes I overdo it! Hah. That’s when I take to the blog and offer these to you. 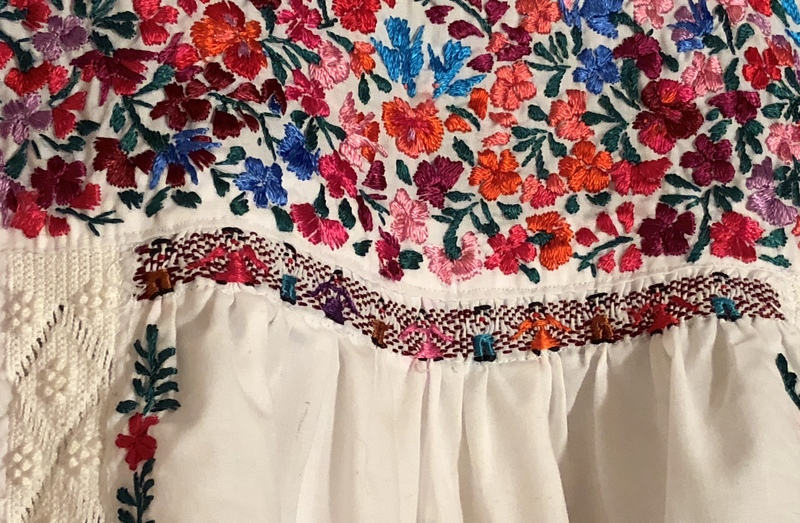 Chiapas in February 2019 and do your own shopping! 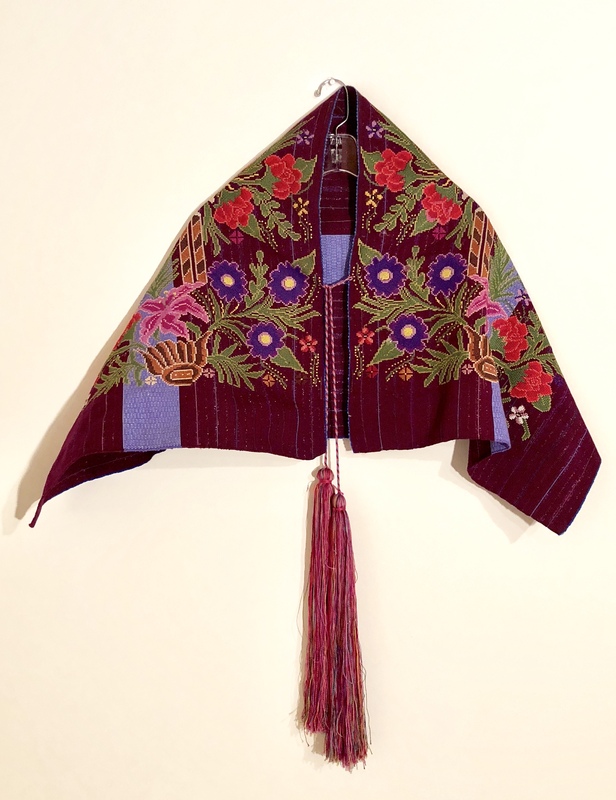 This entry was posted in Clothing Design, Textiles, Tapestries & Weaving, Workshops and Retreats and tagged Chiapas, clothes, for sale, Mexico, Oaxaca. Bookmark the permalink. Interest in #5 if it will go over my head. Norma I would like #5 if still available. Also can you get it over your head or is it cut very small. I really like #4! Put my name on it, pls. It’s yours, Olive. Thank you.